Castrol Edge Titanium presents The D1NZ National Drifting Championship Series Round 2 and Round 1 of The NZ Time Attack Series. A proven and well liked track amongst racing enthusiasts, the track continues to play a vital part of racing in the North Island. 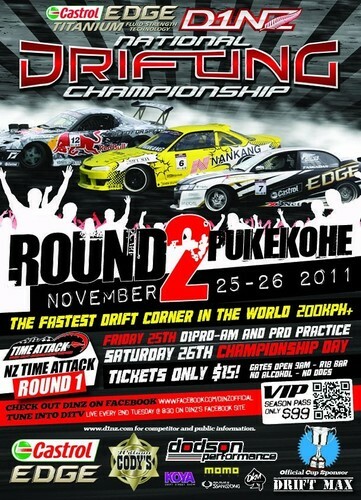 This will be a fantastic event and with Pukekohe being the fastest drifting corner in the world, it will test even the bravest of drifters. This season, D1NZ moves to a Top 32 format which means double the battles and double the action! Lower gate prices this season also means you can bring the whole family minus the huge cost. Be sure to get behind a team this year and support their climb through the Championship Rounds to the top. Stay tuned to the D1NZ Live TV show for all the giveaways, news and motorsport information during the season and keep drifting fun! Please remember at D1NZ events that alcohol, dogs and patches are prohibited. For Round 2 Pukekohe, spectators can bring easy-ups and marquees to keep out of the sun/rain provided it does not block other spectators view on the sweeper and banks. This is your last chance to be treated like VIPs all season! At Round 2 Pukekohe, season Hard Card holders will get access to the pits all day, the best seats in the house, your own private bar, free nibbles and gift bags. Not to mention, the pass contains your photo ID and access to all Championship Rounds for the rest of the 2011-2012 season. All Hard Card holders will also be invited to exclusive D1NZ parties with fantastic perks of being a VIP! 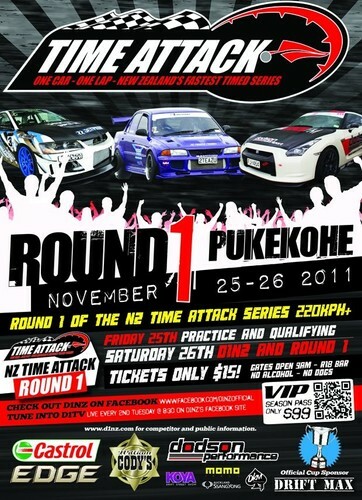 NZ Time Attack will be quick fire sessions to see who has the fastest time around Pukekohe broken into two classes – Pro and Pro-Am.